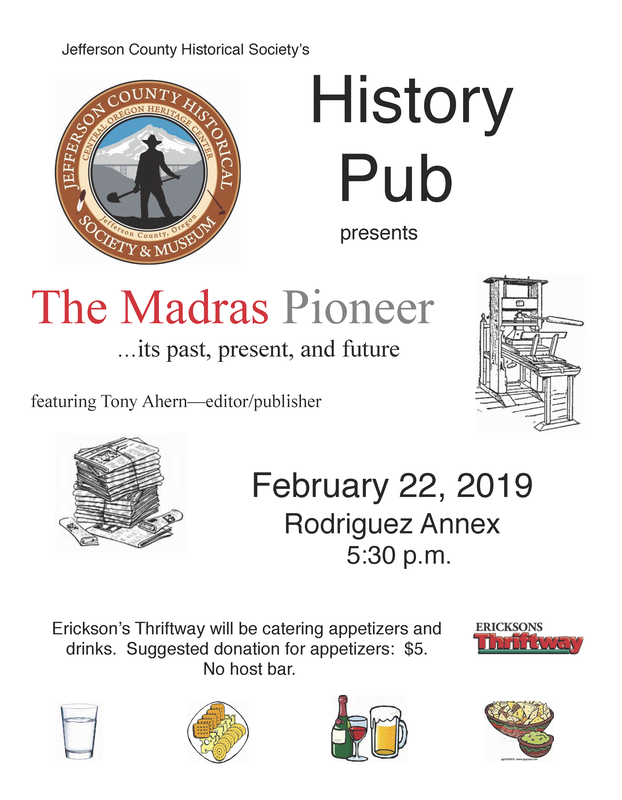 “History of the Madras Pioneer” a program presented by Tony Ahern. Tony’s extensive knowledge of the history of our hometown newspaper will make for an entertaining evening. Tony has been the editor of the paper since 1993, but he also has a deep interest in our local history. Don’t miss this event which will be located at the Library Annex. We are asking for a $5 donation at the door to cover the cost of appetizers. There will be a no-host bar with beer and wine. Our annual dinner this year is sure to be a must see. The guest speaker is Carole Leone. “Looking at the Museum from the inside out.” Carole just recently retired after 16 years as the Executive Director of the Museum at Warm Springs. She will give us her personal experiences and stories about what a museum is all about. Look for your invitation in the mail.